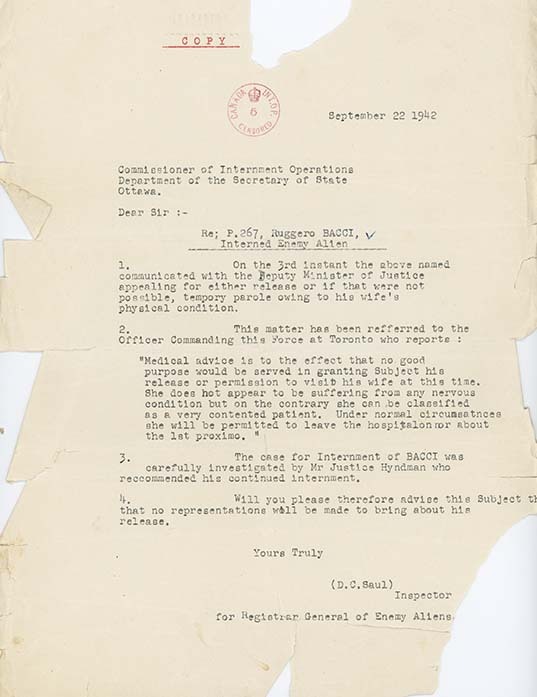 Letter from D.C. Saul (RCMP Inspector for Registrar General of Enemy Aliens), to Commissioner of Internment Operations, September 22, 1942. In this letter, a report is provided on the condition of internee Ruggero Bacci's wife. Previously, Bacci had requested release or temporary parole to be with his wife, who he wrote was not well. The RCMP in Toronto investigated and recommended that "no good purpose would be served" in granting Bacci's request. They note, "She does not appear to be suffering from any nervous condition" and is expected to be released from the hospital within a couple of weeks. Also see LICEA2012.0002.0077 and LICEA2012.0002.0071.